Written by chris maroulakos on Tuesday, October 26th, 2010 at 10:00am. If you don’t like Jail Weddings, you don’t like music. 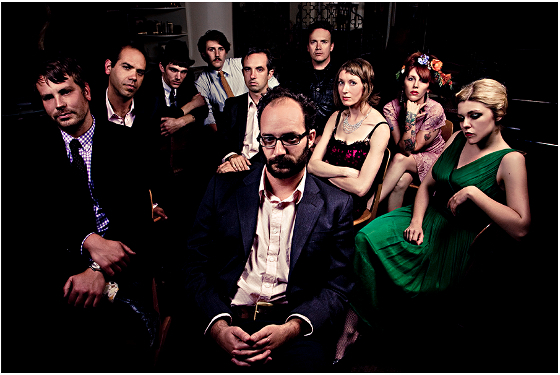 The LA ten-piece takes all the whimsy of 60s-era pop and doo wop and fuses it with a ragged, punch-drunk swagger that’s pure rock and roll. Katya Hubiak and Jada Wagensomer’s angelic harmonies flank charismatic front man Gabriel Hart’s belted vocals while the band backs them with a wall of sound that would make Phil Spector proud. The last time Jail Weddings came to town, they played a blistering set at the Casbah opening for helmeted oddity Bob Log III, and the show was one of the most exciting shows to hit San Diego in recent memory. If you missed it, fear not — the band will bring its soaring sound to the Soda Bar on Friday, October 29th. The San Diego stop is in support of Jail Weddings’ debut full-length, Love Is Lawless, set for release that same week. The album is a vivid dissection a broken Hart — loneliness, self-loathing, and pessimism are all prominent — but the front man’s wry humor and the band’s sugary sound make what could have been a bitter pill to swallow go down easy. The result is one of the year’s most exhilarating and infectious records, and an assured statement of purpose by one of LA’s most compelling groups. Needless to say, Jail Weddings will have plenty of great material to play at their Soda Bar show, so don’t miss it. Mrs. Magician and Dreamboat will open, and you can buy your tickets here.